More than 110 million years ago, an enormous, ferocious crocodile roamed land that is now Niger, Africa. This 40-foot-long crocodile was feared among other living animals, because it ate dinosaurs. Scientifically, it’s known as Sarcosuchus imperator, Latin for “flesh crocodile emperor,” but nowadays, it’s simply called SuperCroc. The SuperCroc is coming to Elgin, in an impressive exhibition that will debut on May 4 at Gail Borden Public Library, 270 N. Grove Ave., and continue through the summer. The free exhibit features several different components and displays that will be set up in various parts of the library. The exhibit is presented as part of one of the programs offered by Project Exploration, a nonprofit science education organization that works to make science accessible to the public through personalized experiences. Project Exploration was cofounded by Dr. Gabrielle Lyon and University of Chicago paleontologist Dr. Paul Sereno, who both joined an expedition to Niger in 2000, in search of the ancient crocodilian. The exhibit, which includes a life-size reconstruction of the SuperCroc skeleton, engages visitors in the step-by-step research that brought this creature back to life. Various components highlight the team’s discoveries and allows them to explore the process of uncovering fossils and examine how scientists pieced them together using knowledge of modern alligators and crocodiles. The display even includes a tent that was used in the expedition. The Gail Borden Library is an extraordinary site, even without a museum-class exhibit. The 140,000-square-foot building in downtown Elgin is the third-largest public library in Illinois, and its Rakow Branch, 2751 W. Bowes Road, is a 10,000-square-foot LEED gold-certified green building. The combined facilities welcome one million visitors a year and have 180 employees, 300 volunteers and 450,000 materials. The downtown branch also includes a restaurant, a room dedicated to activities for teenagers and a River Room with breathtaking views of the Fox River. Construction of the exhibit begins April 29 and will take staff and volunteers between three and five days to assemble. The work will be done during regular library hours, so that guests can view the process firsthand. The library also is planning smaller exhibits throughout the building. Putting together an exhibit of this scope is intense for the library staff and requires long hours working with partners and the community. Library officials say it’s worth the extra effort. More than 160,000 visitors are expected to see the SuperCroc exhibit. This isn’t the first time the library has partnered with Project Exploration. In 2005, the two organizations collaborated on an exhibit called “Giants: African Dinosaurs,” which 14,000 school-aged children toured during class field trips. Two years later, the library hosted another successful exhibit, “Space: Dare to Dream.” Plans for the SuperCroc exhibit began in earnest six years ago, following the success of the dinosaur exhibit. The partnership between the library and Project Exploration is a natural fit. The latter reaches underserved children through youth development programs, school services, exhibits and online programs. The organization was founded 13 years ago on Chicago’s South Side, when Lyon and Sereno realized that kids who were struggling in school had a dearth of opportunity for positive hands-on science experience. Lyon was part of the team that traveled to Niger in 2001 to discover and unearth parts of the SuperCroc skeleton. Excavation took just one visit, Lyon says, but the exhibit’s storyline was developed over a series of expeditions. When the team returned home, Sereno and Lyon co-wrote and designed the exhibit, which first appeared at Chicago’s Museum of Science and Industry in 2003, and now travels all over the world. Lyon and Sereno designed all of the interactive and paleontology exhibits for SuperCroc and other dinosaur exhibits, all of which are based on original fossil material. Sereno and Lyon believe they know how SuperCroc behaved, based on what the fossil records indicate and observations of modern crocodilians. 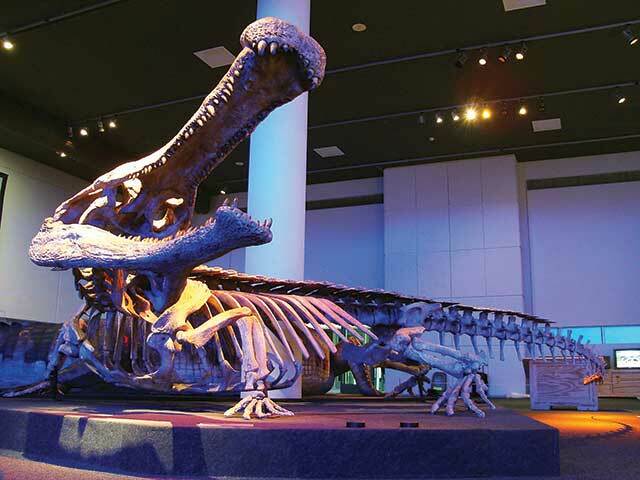 They amassed about 50 percent of SuperCroc’s skeleton, enough to assemble a life-size model. The swollen end of the snout has a large cavity under the nostrils, which means the croc may have had an enhanced sense of smell. Its eye sockets project upward, for scanning the river’s edge while submerged. While the SuperCroc grew to 40 feet long, it weighed about 10 tons. Sereno will make an appearance this summer at the Gail Borden Library to talk more about the team’s findings. Library officials believe the SuperCroc exhibit is important to Elgin for several reasons. It has broad appeal and connects people of different ages, backgrounds and socioeconomic levels. It also enhances summertime educational programs, and motivates young people to read and learn about science. The cost to bring the SuperCroc to Elgin was approximately $100,000, about a quarter of which the Library Foundation paid. The Grand Victoria Foundation, the community grant-making wing of Elgin’s casino, contributed $25,000 and is matching another $25,000. The remaining funds will come from a variety of library supporters. “It’s wonderful that people in the community have confidence in what our library can do,” says Raleigh. The Grand Victoria Foundation helped to fund the dinosaur exhibit eight years ago, and was eager to join the library’s latest project. “It’s been the foundation’s experience and observation that the Gail Borden Library is a dynamic anchor in both Elgin and the surrounding areas,” says Nancy Fishman, the foundation’s executive director. “Elgin is our hometown, and we’re a statewide grantmaker. One of our goals is to help communities to be great places to live and work. For Gail Borden to step outside the library box makes Elgin a great place to live and work. Library officials believe that SuperCroc will increase reading participation, especially in the summer program. In 2012, the City of Elgin, the Elgin Housing Authority, School District U-46 and the Boys & Girls Club worked together to boost the library’s summertime youth reading program to an all-time high of more than 8,500 registrants and more than 3,700 finishers. Although she’s well familiar with SuperCroc, Lyon looks forward to revisiting it this spring. This entry was posted on Friday, April 12th, 2013 at 12:00 pm	and is filed under Mind & Spirit, Top Posts. You can follow any responses to this entry through the RSS 2.0 feed. Both comments and pings are currently closed.